But you can't cut your way to recovery. Capturing our conflicted economic zeitgeist, the Wall Street Journal came out with two conflicting headlines on the same day: while one gave faint encouragement that The Sluggish Economic Recovery Proves Resilient, the other countered incredulously: Wait, What Recovery? According to the National Bureau of Economic Research, the arbiter of when the US economy enters recession and recovery, we've been in the latter since June 2009. This means that, at 58 months, this lackluster recovery is passing the median age for all post-World-War-II up-cycles. 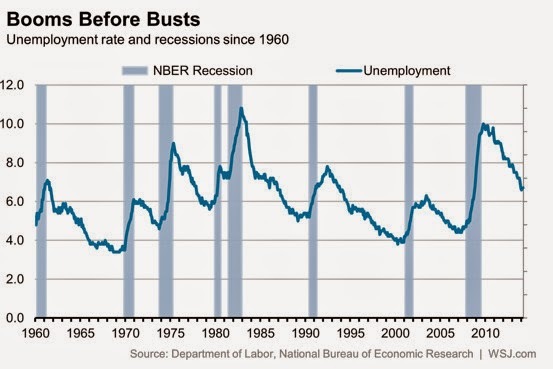 Not that it feels like a recovery: as seen in the Journal graphic above right, the unemployment rate is quite above average for a recovery at this stage in the cycle. Moreover, much of the drop in the jobless rate has been a counterintuitive effect of the withdrawal of unemployed workers from the labor force, which reduces the denominator on which the unemployment rate is calculated. Many doubt that there is even a recovery at all, since it certainly does not feel like one. Although the Journal's Real-Time Economics blog patiently explains that, yes, according to the way such things are determined, we really have been recovering, it went on to acknowledge another way of measuring the question of whether all of the jobs lost in recession been regained; the answer is a resounding No. By this measure, the recovery is at least incomplete. Why haven't things gone better? Well, government austerity is partly to blame. Private-sector jobs have at least made up for all their losses since 2008, but government employment lags badly, leaving the overall total quite insufficient. Much longer in the making is the problem of low and declining wages for the average American worker, which the recovery has done nothing to improve. In the face of all this, the Fed has undertaken extraordinary measures to cut short- and long-term interest rates, in the hope that cheap money on Wall Street would lead to more economic activity on Main Street. However, the Fed can't spur a vigorous economic snapback because short-term interest rates are already near zero, says Robert Hall, a Stanford economist with the NBER. To do that takes actual demand, and that's outside the realm of central banking.